Servicing your car with quality motor oil is essential but between and after servicing, you can use an oil additive to keep your engine protected and running smoothly. It achieves this by improving the lubricant performance of the engine oil. The best oil additive is the Liqui Moly Cera Tec Friction Modifier, which can be mixed with all commercially available motor oils. Using an oil additive for older engines in particular has a range of benefits. These include helping the engine cool down, reducing noise and emissions, improving fuel economy and more. They really do transform the way your engine performs. 7.1 What is it and How do Oil Additives Work? 7.5 How Often Should You Use It? Oil additives have been used for many years now and are most effective when used with high mileage or older engines. The main aim of the additive is to ensure that all the moving components of the engine remain lubricated and prevent wear in order to improve the longevity of the engine. There is nothing worse than having a product that promises so much but delivers so little. However, investing into a quality additive for your oil can see a range of benefits and all our recommendations do as they promise. 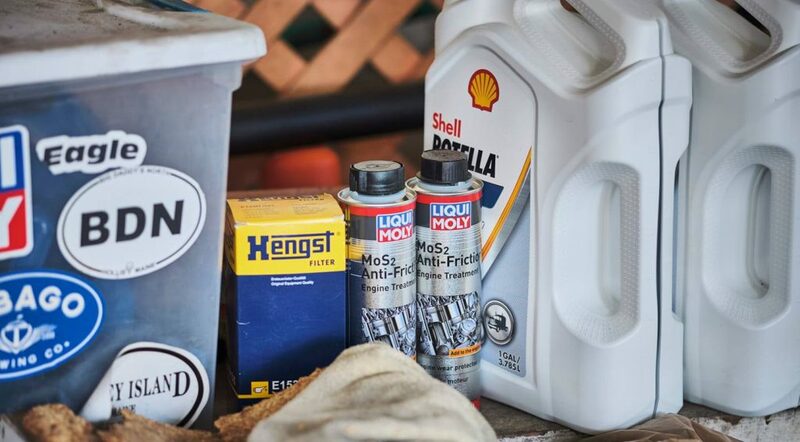 Below is a list of the best oil additives that will help reduce wear, heat, friction, increase fuel economy and help clean and protect the engine. Liqui Moly Cera Tec is a highly rated and popular oil additive on a global scale that is designed to reduce friction and wear within the engine. This is made possible by the ceramic compound, which can withstand high thermal and chemical loads. In terms of using the Liqui Moly Cera Tec, you simply pour it straight into the oil because it is a self-mixing formula (as shown in the main image). Once it has mixed with the oil, the brand claim it will protect the engine for up to 50,000 KM. Overall, the Liqui Moly oil additive is an excellent choice that will keep your engine running smoothly. It has everything you would expect from the best oil additive but it does come with a high price tag. Sea Foam is by far the most popular oil additive and it can be used in both automotive and marine engines. It is an EPA registered product that contains 100% per petroleum for optimum cleaning power when mixed with the oil. For those requiring an oil additive for older engines, the Sea Foam Motor Treatment is highly recommended. It can be used in the motor oil, injectors and induction for excellent results time and time again. This additive has been around for many years now and there is a good reason why it is still on the market and popular. The Archoil AR9100 oil additive is another popular additive that can be used with both conventional and synthetic oils. Although you can use it for both fuel types, it is more suited to diesel engines and even the much larger Cummins, Duramax and Power Stroke engines. Overall, the Archoil AR9100 Friction Modifier is the best oil additive for diesel powered vehicles with great results for larger truck engines. The formula also works for hydraulics, transmissions, power steering and differentials oils too. Lucas is a popular automotive brand that proudly produce all their products in the US. Their heavy duty oil stabilizer promises to increase the life of the oil by over 50% and reduce oil consumption. The brand also state that this oil additive can be used in new cars without voiding warranties, which is good to know. It can also be used with tractors, military equipments, motorhomes and even boat engines. Overall, the Lucas Heavy Duty Oil Stabilizer is a great all-round additive and offers excellent value for money when compared to the alternatives. Best Line is a premium additive that coats all the metal surfaces with a protective layer, which reduces engine noise and wear. It is a 100% synthetic formula that is compatible with all motor oils. Overall, the Best Line Oil Additive is an affordable choice that provides great results and is compatible for all motor oils. It is a very popular additive that promises to protect and helps improve fuel economy and performance. Investing into a quality oil additive can completely transform the way your engine performs. However, it can also be used in a range of other oils that include automatic transmission fluid, differential oil, power steering systems and others. Using an oil additive has many benefits that include a quieter and smoother engine that runs more smoothly with an increase in fuel economy too. Unlike other additives, the recommendations within this article deliver results and are not fake claims. To help you make an informed buying decision, we have produced the below buying guide regarding oil additives. What is it and How do Oil Additives Work? Unlike other additives that claim to provide a range of benefits, oil additives have been tested and proven multiple times. The most important chemical within the formula is zinc and it will act as a performance booster. Along with zinc, there is another common chemical known as Phosphorous, which provides the protection aspects of the additives, which include reducing metal to metal contact and wear and tear. Oil additives work by altering the viscosity of the motor oil in order to achieve better performance. For example, if the viscosity is too high, it can gunk up the engine and generally be too thick to provide adequate performance. Alternatively, if it is too thin, the motor oil will provide very little protection to the engine. Using an additive will put the motor oil to its correct viscosity and ensure the engine runs smoothly and at its best. There is a complete range of oil additives available where some claim to lubricate engine components, reduce friction and much more. Therefore if you notice that your engine is lacking in a certain area (i.e. knocking noises), it would be advised to use an additive that is designed to tackle the direct problem. All of our recommendations cover a variety of potential issues that can occur with older engines and even modern engines. Most additives are suitable for a range of engines but some are dedicated towards a certain fuel types such as the Archoil AR9100. However, due to the complexity of most modern engines, we would recommend checking whether you are able to use an additive. This is due to the fact that the viscosity may change the oil too much, which may result in the modern engine illuminating an engine management light. Older engines in particular can benefit hugely from using an oil additive. They can still be used in modern engines but due to the complexity on these engines, modifying the chemical formula of the overall oil may effect the performance. Metal to metal contact can cause complete engine failure if left untouched. The contact causes components to become worn and it produces tiny metal debris that collects in the engine oil. This can be seen quite clearly during an oil change and it something that you should look out for. If it that bad, you may want to use an engine flush to complete clean the inside of the engine. Before letting the engine get to this point, you should be either using an oil additive or performing an oil change. If you are noticing that your miles per gallon is not meeting expectations, it may be due to the engine oil. If the moving parts of the engine are not lubricated appropriately, there will be an increase in friction, which means more stress on the engine. Helping lubricate these components with an additive can see minor MPG gains. As an engine begins to age, debris and sludge can buildup, which can cause performance issues. Using an oil additive will help remove and move the debris away from metal surfaces. This will also help the potential of corrosion to exist. Most oil additives can be added to motor oil at any time but we recommend using them at every oil change. However, it is best to follow what the manufacturer states as some differ. We would also advise that you only use the specified amount once per oil change because using it too often may completely change the chemical formulation of the oil. Unlike other components of your car, the engine will require regular maintenance. The quality of the oil can make a big difference with regards to performance. Investing into a true oil additive can help keep your engine running smoother, cleaner and keep it protected so that it lasts longer too. All of our recommendations are used by professionals and enthusiasts worldwide. They are also big brands with a reputation that you can trust to deliver on what they promise. Many even offer their own fuel injector cleaner products, which may be very beneficial.